Looking for a nursing job in Atlantic County? Nursing RN LPN CRNA & CNA jobs are listed below by healthcare facility in Atlantic County New Jersey to include Atlantic City area hospitals. The listings here lead to the job opening or recruitment pages for hospitals and facilities in the Atlantic County area to find Clinical, New Jersey Licensed Practical Nurse LPN, Advanced Registered Nurse Practitioner ARNP, Registered Nurse RN, and Certified Nursing Assistant CNA employment opportunities. AtlantiCare is the region's largest healthcare organization and largest non-casino employer, with more than 5,170 employees and 600 physicians in nearly 70 locations. During review a sampling of open positions found included Advanced Practice Nurse, Behavioral Technician, Blood Bank MT, Clinic Psychiatrist, Emergency Room Tech, Mental Health Screener, MT/MLT Core Lab, Part Time Cardiovascular Technician, Patient Access Associate, Physician Assistant, Registered Nurse Progressive Care Unit RN, Registered Nurse Acute Dialysis, Psychiatric Nurse RN, Certified Medical Assistant, Registered Nurse Emergency Room, Registered Nurse Psych Intervention Program, CRNA, RN Case Manager, Registered Nurse RN Renal Dialysis, Full-time Certified Home Health Aide, Licensed Practical Nurse Stroke LPN, Medical Assistant Certified, Emergency Room Tech, Home Health Aide HHA, Oncology Nurse Navigator, Social Worker (BSW), Paramedic, Pharmacy Tech l, Pediatric Advanced Practice Nurse, Perinatal Sonographer, Women's Health Nurse Practitioner, Registered Nurse Labor & Delivery, and Therapist LCSW or LPC. Jewish Family Service of Atlantic & Cape May Counties is a full-service social service agency with a staff of 140+ that each year serves more than 8,500 individuals. Shore Medical Center employs nearly 1,500 professionals and volunteers. Here you'll find opportunities such as Medical Staff Services Assistant, Nurse's Aide, Nurse's Aide Medical Telemetry, Pharmacy Technician, Medical Assistant, Registered Respiratory Therapist, RN Emergency Department / Pediatric Care Center, RN Surgical Services, and Social Worker MSW. Atlantic County operates Meadowview Nursing and Rehabilitation Center with jobs that become available periodically for positions such as Practical Nurse. Absecon Manor and Mainland Manor are a part of DePaul Healthcare. During review open positions included Nursing Home Licensed Practical Nurse LPN, Certified Nursing Assistant CNA, and Registered Nurse RN External Liaison. Check for updates. Brandywine Living is a premier provider of quality care and services to seniors. At various locations you may find job openings such as Wellness Nurse LPN, Care Manager (Nursing Assistant), Care Manager - Home Health Aide (HHA), Care Manager (Nursing Assistant Memory Care), Registered Nurse RN, and more. Health Center At Galloway had been hiring for the position of Part-time Certified Nursing Assistant CNA. Check for new listings. Heartland Hospice is part of HCR ManorCare, a leading provider of home health care, hospice care, skilled nursing, post-acute rehabilitation and memory care. Heartland Hospice periodically hires for positions such as LPN / LVN, Resident Caregiver, Physical Therapist Assistant PTA, Certified Occupational Therapy Assistant COTA, Hospice Nurse RN, PRN Nursing Jobs, PRN Registered Nurse RN Hospice, Certified Nursing Assistant CNA, Social Worker Licensed-Hospice Services (Full-time) LSW/MSW, Dietary Aide, Unit Manager RN, CHHA- Hospice PRN, and more. BAYADA Home Health is a trusted leader in providing clinical care and support services at home for children and adults of all ages. 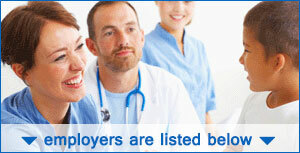 Holy Redeemer Home Care is a good resource for an ongoing variety of nursing opportunities.